Skin Script is dedicated to beautiful, healthy skin using fresh thinking to deliver the latest in vitalized, youthful looking skin. This clinical-grade professional skin care line contains retinols, glycolics, lactics, salicylics and natural lighteners. Products are designed to work with the skin without causing irritation, “chirally correct,” leaving your skin feeling refreshed and hydrated. Skin Script products not only soften, but polish the skin, making it glow! Targeting concerns of aging, acne, clogged pores, fine lines, age spots, hyperpigmentation and melasma, Skin Script achieves advanced results! 17% Glycolic Cleanser: A gel based cleanser containing a combination of alpha hydroxcy acids that renew the skin by loosening the uppermost layer of dead skin cells to reveal a bright and smooth surface. Best suited for Aging and Acne skin types. Green Tea Citrus Cleanser: Purify and restore environmentally challenged skin with this multi-function prep step to protect skin from cellular damage. Ideal for all skin types especially sensitive and Rosacea. 2% Retinol Scrub Mask: Jojoba beads provide physical exfoliation while other exfoliating and lightening ingredients work in tandem to refine the skin and lighten discolorations. 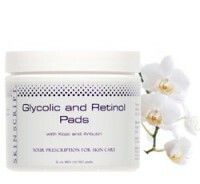 Glycolic and Retinol Pads: Designed to gently and progressively renew the skin to brighten, lighten and renew. Cucumber Hydration Toner: Rehydrates the skin while restoring cellular functions an absorption of ingredients. Soothes and balances skin tissue and surface lipids. Active ingredients contain Hyaluronic acid, Heavy Aqua, Borago seed oil, and cucumber. Recommended for all skin types and conditions. 15% Vitamin C/Green Tea: This super anti-aging serum contains 3 forms of Vitamin C along with Peptides, Co-Q10, and Green Tea Leaf extract. For all skin types in need of protection and anti-aging care. Ageless Skin Hydrating Serum: A multi-purpose hydrating serum that assists in boosting hydration levels and balances surface lipids. All skin types, especially dehydrated and dry skin, acneic, and milia-prone. Peptide Restoration Moisturizer: This peptide based moisturizer is recommended for normal to dry skin types; mature skin in need of repair or healing. Peptides boosts collagen production, activate skin repair and reduces appearance of fine lines and wrinkles. Additional ingredients include Alpha Lipoic Acid, White Tea Leaf Extract and Co-Q10, and Shea butter. Acai Berry Antioxidant Moisturizer: Rich in Alpha Lipoic Acid and Jojoba Seed oil, this super antioxidant moisturizer protects the skin from environmental damage, relieves the surface signs of aging while leaving the skin super soft.